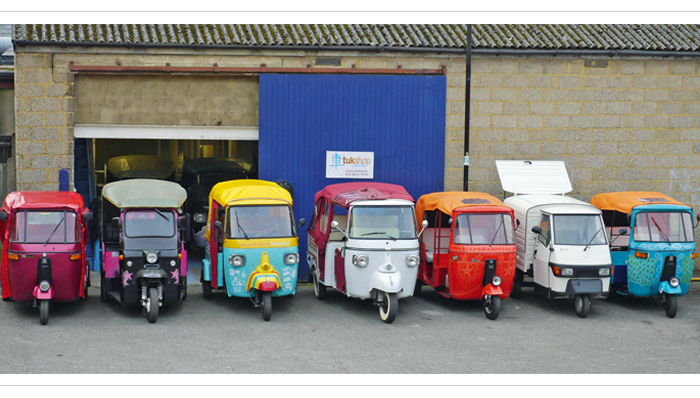 Shift your wedding up a gear and make your entrance in a decorated rented tuk tuk from Tukshop, the UK's tuk tuk pioneers with fully road legal models from Asia and Italy. With a huge selection of chauffeur-driven tuk tuks for rent (and sale), including new models for 2015, Tukshop’s huge showroom in Southampton will have something to suit your Big Day, wherever it is in the UK. Fully convertible with an all white leather interior, the Calessino Arctic White & Red Drop Top uses zips up to protect passengers from the weather. Only 500 have ever been made, making these limited edition beauties truly unique. We love it dressed with colourful strung garlands - Mumbai style! Put the va-va in your groom with the slick Peacock Blue Bajaj tuk tuk. From the Tuk Shop’s 'Downtown Mumbai' range, the tuk tuk has been hand painted with peacock-inspired motifs at the world-renowned Pinewood Studios. The vintage-looking model sports an orange hood and blue body with white interiors and is highly sought-after for Asian weddings. Many couples have used the tuk tuk as a photobooth and prop as well as for opening and closing ceremonies. Another jewel from the 'Downtown Mumbai' collection is the classic Bajaj 'Sweet Chilli' model, also hand painted at Pinewood Studios. The vibrant orange hooded ride will really stand out against the winter sky and will ensure all eyes are rightly on you come the Big Day. Tukshop provide embroidered throws and cushions too, to make sure that your journey is as comfortable as possible. You won’t have to worry about making it to the wedding on time – this baby can stop traffic!